Image caption Louis Ross: "I don't think I would make it through another winter"
Traders in Barry Island fear they could go out of business if on-street parking charges are introduced at the resort. Vale of Glamorgan Council has proposed charges which would range from £2 for two hours to £10 all day. 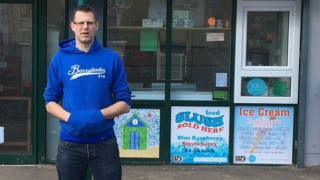 Louis Ross, who owns the Barrybados gift shop, said winter visitors were most likely to be put off by charges. The council said it wanted to boost the use of car parks, adding that people would also be given the option to park on the street for longer periods. The planned charges would be in place seven days a week, throughout the year. A petition signed by 2,500 people claims businesses could close as a result. Opponents have urged the council to keep the first two hours parking free and offer a winter reduction on charges for longer periods. Mr Ross, who launched the petition, said his shop's turnover drops by 70% out of season. "If people have to pay to park during the winter they are going to go somewhere else that's free," he told the Local Democracy Reporting Service. "I don't think I would make it through another winter." Out-of-season discounts are proposed for the Knap and Bron-y-Mor car parks in Barry, and on-street at Penarth Esplanade, but not at Barry Island. Plans to charge for on-street parking in town centres across the Vale of Glamorgan were dropped following public opposition. A council spokesman said the changes were "geared to better promote our car parks as the main parking locations but to also provide an option for those who wish to park closer to the beach and other amenities for longer periods". He also pointed to the alternative travel options of "regular bus and train services and safe and accessible pedestrian and cycle routes from various locations in Barry". Councillors will discuss the proposals next week.